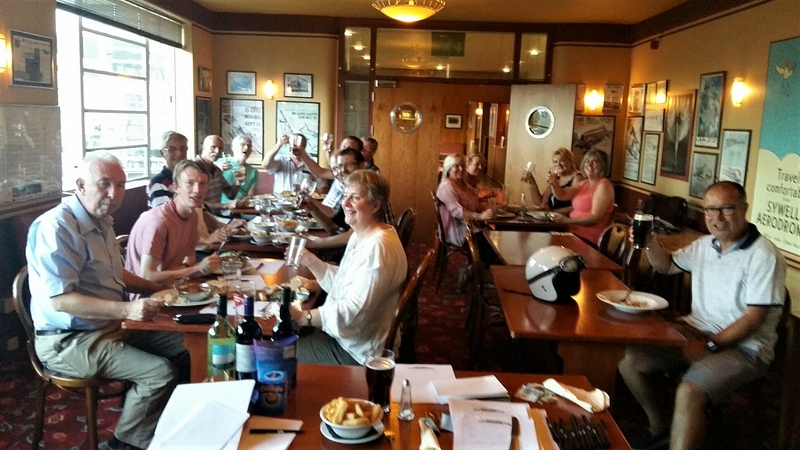 Well our Big Summer Pub Quiz was a roaring success, with fiendish questions, fierce competition and glorious prizes (well, fairly glorious chocs and plonk at least!) Once again we were raided by our friends from the Leicestershire Group, who increased the merriment and threw themselves into the action! A great night, thanks to all who took part. Thanks to the helpful staff at Sywell we had a room to ourselves and there was a good choice of food, which we enjoyed. Congratulations to the „Aviators", who won with a colossal 45 points and took home the grand prize. However, it was a close-fought quiz, so equally well done to the"Hangar Ons" with 43 points and the „Chitty Radiators" with 39 points. As I write we are looking forward to the Sywell Pistons and Props event. We have a full contingent and will display some excellent TR Nene Valley vehicles over the weekend. Sywell Aerodrome really is a lovely venue, we enjoy meeting there every month-well chosen for the Register's AGM in November, we think! Soon it will be time to put the TR into the garage for winter "fettling" so it is ready for the next season, but our monthly meetings still go on, so if you can, do join us on the first Thursday of the month for a drink and a natter-all are most welcome.